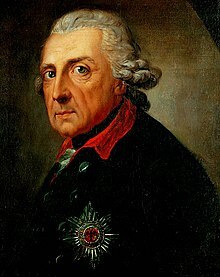 Frederick II (German: Friedrich; 24 Januar 1712 – 17 August 1786) wis the third Hohenzollern keeng, reignin ower the Kinrick o Proushie frae 1740 till 1786. 31 Mey 1740 – 19 Februar 1772 – His Majesty The King in Proushie. 19 Februar 1772 – 17 August 1786 – His Majesty The Keeng o Proushie. ↑ Frederick wis the third an last "Keeng in Proushie"; beginnin in 1772 he uised the teetle "Keeng o Proushie". This page wis last eeditit on 1 Juin 2018, at 11:10.